Many books written for businessmen focus on the bottom line, on looking out for number one. If there is some way to manipulate your clients into forking over more of their cash, so much the better. Dr. Habib Chamoun, however, has written a business book with a soul. His wide-ranging volume on negotiating with persons from other cultures looks beyond maximizing profits. Instead, he advocates the building of long-term relationships with clients. A client from a different culture, however, is likely to have goals that differ from yours. We negotiate because of differences in how we think, feel, and act. Although of course such differences exist even within a culture, they are heightened when dealing with another culture. Each culture sees the world differently. These differences are an opportunity to learn the best of what another culture has to offer, so that we may apply it to our own lives or businesses. Therefore, Dr. Chamoun advises that we study the cultures of our clients. In this way, we will have a better chance to build long-term business and personal relationships. One of the best features of this book is Dr. Chamoun's personal expertise regarding the Mexican culture. He points out that Mexican culture favors relationship-building. In fact, there are many parts of Mexico where a firm handshake means more than a written contract. Learning and applying these cultural insights increases the strategies that one can use in various situations. Thus is success achieved. The opposite of this global vision is a focus only on price, which Dr. Chamoun asserts generally leads to failure, in the long run, because such an approach tends to destroy trust. Focusing only on price (that is, trying to sell too high, or buy too low) tends to build mistrust. argues for the value of relationship building over cash. 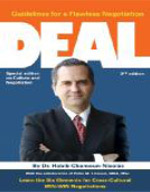 Unlike many business books, "Deal" has a moral sense. Nothing replaces relationship-building on an individual basis. Every individual has a unique negotiating style. Moreover, individuals can change. All of us have changed over the years. The goals that we had a year ago, or even three months ago, are likely quite different from the goals we have today. And so, for where we are at the moment, we must design an action plan, with steps and activities to carry out to help us meet our changing objectives. Each project is different and unique. We should seek continuous improvement at all levels. However, since we and our objectives and our world are constantly changing, future planning is almost impossible. We rely more on quick reactions and on our intuitions. We are constantly confronted with immediate problems, which generates a flexible attitude along with a tendency to work towards short-term results. Paradoxical though it may seem, one must be both firm and flexible. In spite of so much instability, we must plan actions so that we achieve our goals. Our objectives should be clear, and should all be in the same direction. We must work towards fulfilling our dreams. In order to do so, it's good to have a Plan B, in case Plan A fails. In any negotiation it is a good idea to visualize multiple alternatives to the agreement. Negotiations are a continuous process of problem-solving. To solve a complex problem, divide it into several segments and solve it step by step. Another important element of problem solving is to let bygones be bygones. Rather than worrying about the past, we do far better to prepare ourselves for the future. Through savings and investments over time, we will have the resources to face whatever the future brings. TIME, that is, can lead to a gain in power. Clearly, there are vast differences in power among nations. This is perhaps clearest in the case of Mexicans and Americans. There may be no other border in the world where the differences between the two countries are so stark. Because of its economic and military strength, the United States generally has the upper hand. Perhaps in the past, some Mexicans may have tried to take advantage of North Americans, considering their relatively vast wealth. Chamoun's conviction, however, is that Mexicans are moving more towards a win-win business model, towards the building of long-term relationships. Long-term relationships of quality are possible only if the participants are honest and ethical. However, when one party to a negotiation seeks to take advantage of the weaker party, the weaker party can simply walk away, at least temporarily and perhaps permanently. Chamoun points out that many Mexicans have simply walked away from negotiations without explanation. It may have been an effort on their part to gain power. With skill, the weaker party can reduce the differences in power. It is not always the strong who take advantage of the weak. But, the weaker has to use the best possible strategies to even out the disparity. In this way, the weaker party can be more powerful than he at first appears. He may, for example, have the moral high ground. A powerful, but immoral, party may be weaker than is generally assumed. If a balance of power can be found, this can lead to a long-term business or personal relationship. In a beautiful simile, Dr. Chamoun notes that a long-term relationship is like a tree that grows and flourishes when well cared for. Some projects are of very long duration, requiring multiple agreements along the way. To enhance the relationship, it is always necessary to respect and support the communication process. One way of doing this is to let the other party speak first, and to listen to what he has to say. Sometimes, we have difficulty differentiating the personal from the business relationship. To mistake a business relationship for a personal one can be humiliating. It is, therefore, important to remember that a deal does not always mean friendship between the parties. But, whether the relationship is of a business nature, a personal nature, or both, it is essential to build trust. According to Dr. Chamoun, the two factors that tend to lead to a decision to purchase something are liking the product, and trusting the provider of the product or service. The process of negotiation can lead to a client's decision to make the purchase. On the other hand, if neither the person nor the product is worth it, we should avoid the negotiation. Minimizing the bad opportunities gives us the time and the energy to focus on the good ones. Spending time on a negotiation when we don't trust the product or the provider leads to a risk of failure. Sometimes we lose because we play with the wrong people. People are not angels and will sometimes look out for themselves, at our expense. At other times we lose because we are playing the wrong game. Dr. Chamoun counsels that we play the right game with the right people.